The state of California is experiencing a relentless and historic 1200 year drought. This unparalleled disaster has proven to be as crippling and destructive as any in American history. If this slow-motion calamity continues to unfold, as it has over the past four to five years, it may go down as the most consequential drought in American history. 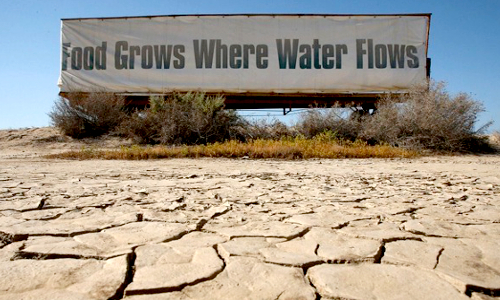 Jerry Brown has been governor of California since January of 2011, precisely when the drought began. Quite curiously, he has taken up many other political issues with the fervor that many think he should have directed toward addressing the drought. Instead, year after year has gone by with nary a peep from Sacramento … until 2015. Brown has recently imposed a growing set of draconian water usage restrictions, the most strict controls ever enacted since the state was first incorporated in 1850. These 2015 water control and restriction initiatives effectively constitute his first response since the drought began. The point is that no other significant measures had been taken by state government which are either proactive or forward-thinking, constructive or provident. More to the point, his various responses to this drought have been downright reactionary. Each and every government edict issued from the statehouse has functioned as a reaction to the behavior of the water consumers of California. The biggest corporate water users (and wasters), quite curiously, have been granted preferential treatment. For instance, the fracking industry has been allowed to use massive amounts of water while the average resident has been significantly restrained in their usage. R E A C T I O N ! “Reaction” in this particular context refers to the infamous Hegelian Dialectic in which the Problem ~ Reaction ~ Solution formula is utilized as a means to manufacture a specific outcome. There are a variety of state-desired outcomes in the case of this catastrophic California drought. Each “Reaction” by the populace to the “Problem” of the drought is first manufactured with the daily involvement of the mainstream media (MSM). Then, the state government kicks in with their predetermined “Reaction”. Ultimately, the perfect “Solution” will be presented when the requisite majority of citizens is sufficiently softened up to accept it without protest. That a full-blown and unrelenting drought would be artificially fabricated in this manner is quite an extraordinary feat of “Problem”-making. There are very good reasons for such an extraordinary endeavor, and Governor Brown’s leadership appears to be an integral piece of that rapidly unfolding agenda. Particularly in view of Governor Brown’s enthusiastic signing of the recently passed mandatory vaccine bill are many Californians suspicious of his stewardship. Clearly, that single act of betrayal has cast many of his other dubious initiatives throughout his term under a distinctly negative light. Simply put, there are now many residents who feel that Governor Brown is an active participant in a scheme to use the state of California as a means of introducing a whole new out-in-the-open geoengineering regime. The following in-depth essay reveals many of the details of this scheme, as well as those of related conspiratorial plots. Given that California serves as the major agricultural producer for the nation, it does not get any more serious than a drought of this severity, particularly one so unremitting. Simply put, this manmade disaster is shaping up to be the Catastrophe of the Millennium. That may sound like hyperbole until one considers what is truly at stake. Because California was established as the premier agricultural state of the nation, its importance to the food security of the USA cannot be overstated. It also represents the 8th largest economy in the world, thereby making its HUGE contribution to the GDP both overwhelmingly significant to the economic health of this country and, therefore, incapable of being ignored. Except that it has been ignored … consistently and quite incredibly, by both the U.S. Federal Government and the State Government of California. As a matter of fact both President Obama and Governor Brown have been remarkably AWOL throughout this entire saga, with the exception of the passage a new draconian laws which have been deemed necessary in order to provoke a reaction from the people. The complete lack of federal response to the California drought is clearly as deliberate and premeditated as it is a crucial part of the strategy of their overarching and clandestine agenda. The agenda is a complex and convoluted one. 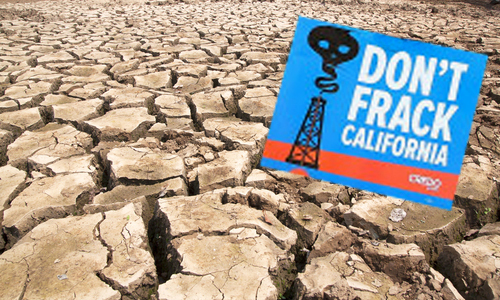 The primary purpose of the California strategy is to use the engineered drought as a means to impose an unlawful geoengineering program … as a ‘remedy’ to this and all future droughts and deluges. There is now no question that the drought was purposefully geoengineered over the course of Jerry Brown’s most recent tenure as governor. He has never once publicly addressed the persistent chemtrails which have been sprayed incessantly over the past five years. And yet in spite of this indisputable evidence, he has never responded to those parties who have provided the volumes of scientific research showing how it was geoengineered. 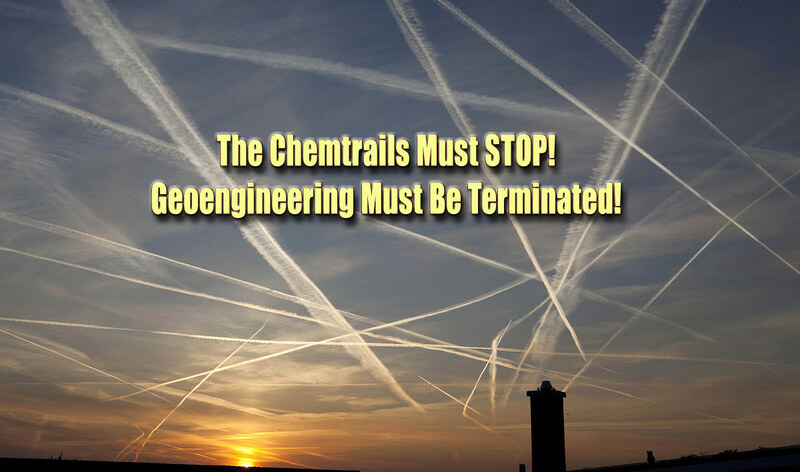 The soil samples alone have revealed shocking levels of aluminum, barium and strontium. Each of these chemical elements just happens to be the major components of the standard chemtrail mix which is sprayed daily across the skies of America. 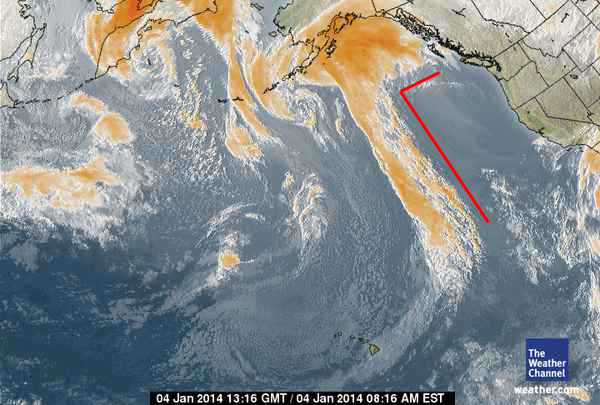 Of course, the resulting chemclouds then rain these noxious chemical agents on the land and water below. Over years of chemtrailing these and other toxic chemical compounds begin to bioaccumulate in the vegetation and animals on land, as well as in the marine animals and plants in the water bodies. Whole forests in northern California are now rapidly disappearing as both heat stress and lack of water conspire with these chemical contaminations to systematically weaken the trees. Then various types of pestilence and other infestations eventually kill off square miles of once healthy trees. Governor Brown is fully aware of this devolving situation and has done nothing to address it. The chemtrailing continues as before despite so many bringing it to his attention. In many locations the chemtrailing operations appear to have been considerably ramped up to an alarming level of intensity. And still the Governor’s office has no response to those who have alerted him to the regularly chemtrailed skies and worsening emergencies across the state (e.g. wildfires in the form of forest fires, brush fires, grass fires; mudslides and flash floods; tree blight and plant pestilence; forest collapse; agricultural contraction; reservoir water loss, evaporating lakes and ponds, etc.). Governor Brown has also received satellite imagery evidence conclusively documenting the role that HAARP technology has played in geoengineering the California drought. Satellite images do not lie, and leave very little room for misinterpretation for those experienced meteorologists who know how to read them. The Brown executive team has received this irrefutable scientific evidence and more. Nevertheless, they have refused to address it in any official manner, and have chosen to ignore it after deliberate consideration. Why has he steadfastly refused to acknowledge them? 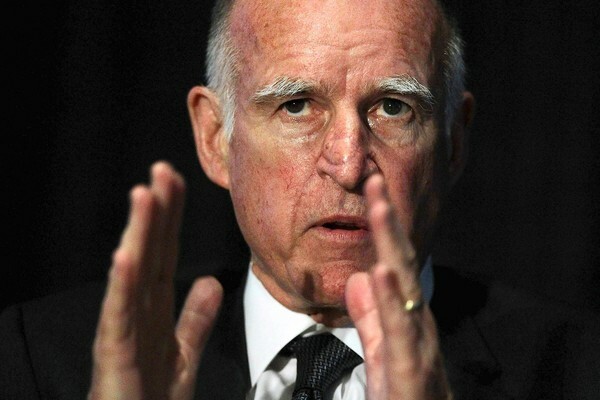 Governor Brown goes back and forth to work everyday just like every other Californian. He sees perfectly clear days turn into cloudy ones in a matter of minutes. Within just an hour of intensive chemtrail spraying, which sometimes weaves an unmistakable tic-tac-toe board across the sky, chemclouds stretch across the previously blue sky, from horizon to horizon. Because of this geoengineering phenomenon, the weather forecasters around the state have been made to look like total incompetents, as are the meteorologists in every state nowadays. How does a state government properly function in a state where the weather is now completely unpredictable, except for those who really do control the weather? Does the governor even consult with his chosen meteorologists during the ever-occurring disastrous weather events? Does he ever convene his panel of climate experts to discuss the reasons for the new climatological trends criss-crossing the state? Just as the current covert and illicit geoengineering regime in California has exposed Governor Brown to be either another willfully negligent political operative who cares not a whit for the state or its residents. Or, he is prominently configured within a pivotal scheme to use California as an example for every other state, should they fail to succumb to the coming ‘legalized’ regime of geoengineering. California does appear to be primary cog in the global machinery that was engineered to implement a New World Order to be administered by a One World Government that will be initially established to ‘fix’ global climate change. The following article well explains both the plot and purpose behind this highly ambitious and fatally flawed scheme. It’s no accident that Jerry Brown’s tenure as governor has perfectly paralleled Barack Obama’s. Both politicos have had carefully managed political images that would be used to corral the entire spectrum of Democratic and left-wing, liberal and progressive voters into a pen of blind acceptance and uncharacteristic compliance. In this fashion a big chunk of the electorate has been used to manufacture consent around some of the most weighty issues that are preparing the way for this newly emerging and highly oppressive carbon management regime. 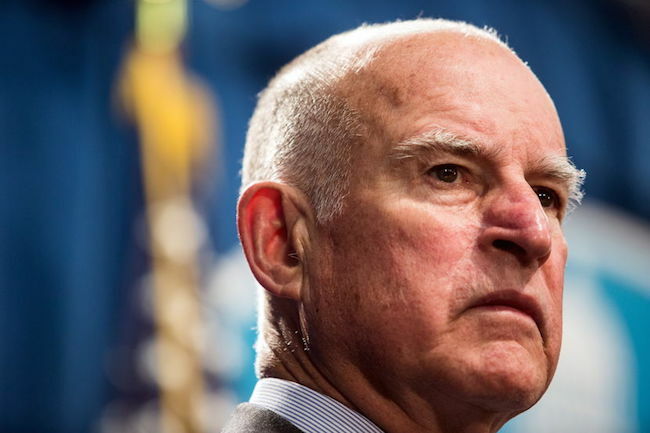 Through his actions and inaction, Governor Brown has violated the public trust. The government of California has broken the social contract. Especially due to willful neglect has Brown’s administration betrayed the people they have sworn to protect. Likewise, Sacramento’s shirking of its most fundamental responsibility to safeguard the state represents a perfidious government that can no longer be tolerated. In light of these serious transgressions against both people and property, Governor Jerry Brown must be recalled. Not to recall him in a formal ballot would signify a profound failing of the people of California. His conduct in office concerning this and other grave matters now demands an appropriate response from the voting public. Just as another woefully inadequate Democratic governor (Gray Davis) was ignominiously recalled and replaced by a candidate from the opposition party, so, too, can Jerry Brown, be successfully recalled. Truly, this governor has morphed into a “corporate fascist” whose treacherous leadership should not be ignored. Surely, the people and the environment stand to suffer greatly from his corrupt administration and unprecedented lack of stewardship. It has never been so urgent that a suitable replacement for Jerry Brown be identified. Any prospective candidate must have the best interests of the people as his/her highest priority. Therefore, it is highly advisable that a rigorous candidate search begin in earnest. Governor Brown must be removed from office with all deliberate speed before the state of California completely crashes and burns.